Saddle Brook, NJ — Slacke, Joseph C. 92, passed into eternal life on March 25, 2017 surrounded by his loving family. A 60 year resident of Saddle Brook, Joe was born in Manhattan, NY, the son of the late James F. and Mary (Metzger) Slacke. After graduating from the Manhattan School of Aviation Trades, Joe joined the Army Air Corps, serving as a gunner on an A-20 Havoc in the Pacific during WWII. Upon his return, he worked as an inspector in the tool and die industry, retiring in 1990. He was an accomplished builder, woodworker, and a talented artist in acrylics and oils. Joe built and flew radio controlled (RC) airplanes and was a member of various local clubs. He was a devoted fan of ‘This Old House.’ He was known for his wry sense of humor, his honesty and his perpetual search for the perfect potato pancake. His greatest pleasure was spending time with his family, who will miss him dearly. He is survived by his beloved wife of 65 years, Marion (Hunt) and five devoted children: Diane Lapsley (Donald) of Flanders, NJ; Christopher (Mary Ann) of Durham, NC; Susan Mansueto (Richard) of Gig Harbor, WA; Patricia of Easton, PA; and Kathleen of Saddle Brook. 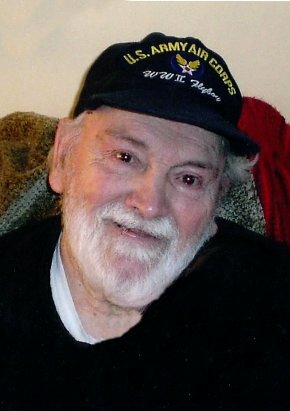 He also leaves behind six cherished grandchildren and five precious great-grandchildren. He was predeceased by his only brother James. Family and friends are invited to visit with the family on Tuesday evening between 6- 9 PM at Vander Plaat – Caggiano Funeral Home, 13-31 Saddle River Road, Fair Lawn NJ. A Funeral Mass will be held 10:30AM Wednesday morning at St. Philip the Apostle Church, Saddle River Road, Saddle Brook NJ, followed by interment at George Washington Memorial Park, Paramus Road, Paramus NJ. In lieu of flowers, donations may be made to American Macular Degeneration Foundation, the Saddle Brook Ambulance Corp or the NJ Alzheimer’s Association. We are so sad to hear about the loss of Uncle Joe. Our thoughts and prayers are with you at this difficult time. Love, Barney, Jen, Jonah and Grace.